When I released the original version of Talon, in January of 2014, I was lucky enough to see my work take off and gain a following. 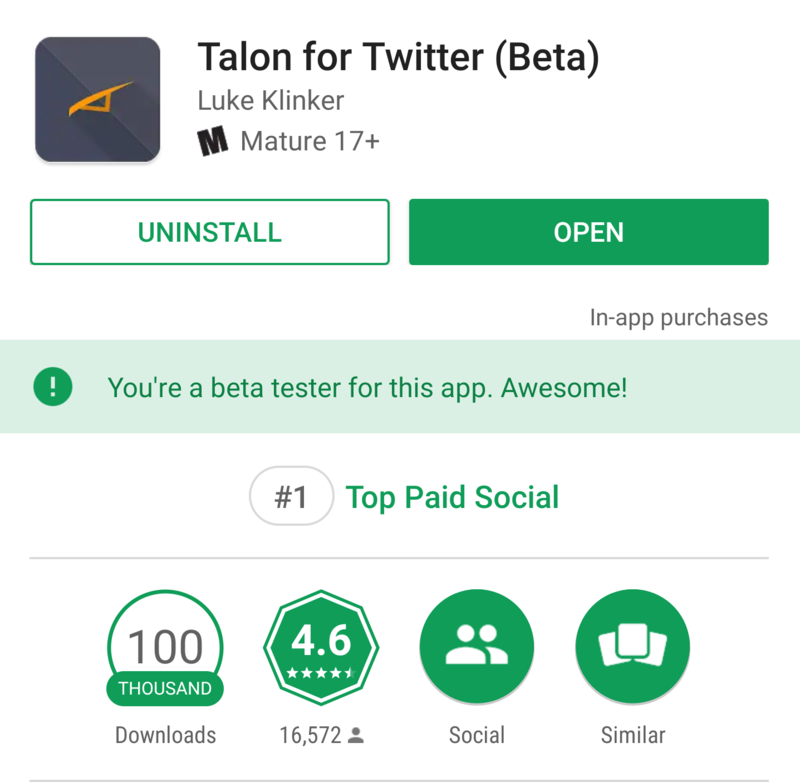 It perched itself at number one on the top paid social apps and within 10 months of it's release, this version of Talon had already hit the infamous Twitter token limit and I decided to open source that version of the app. 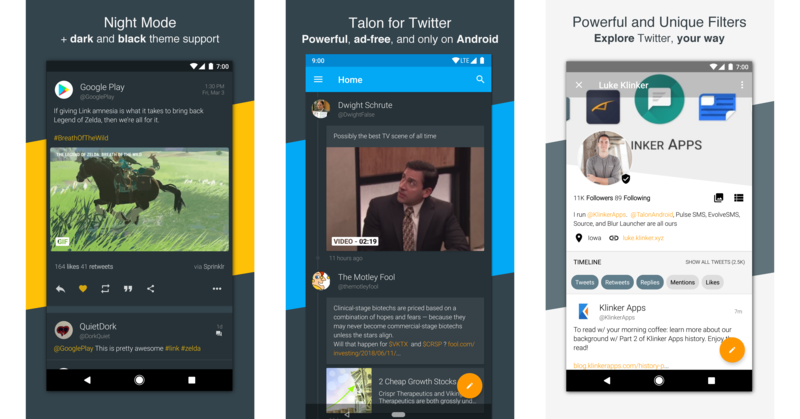 Fast forward to 2018: I was able to re-release a fully revamped Material Design version of Talon for Twitter that has topped the same chart for the past 4 years. As a paid app, it has amassed over a hundred thousand downloads while maintained a 4.6 star rating - something I am extremely proud of, in today's culture. I am extremely excited about this. I have been an outspoken advocate of open source work for years. Many of the components I make for my apps are already open source. For me, it is the perfect way to give back to the community that has given me so much. 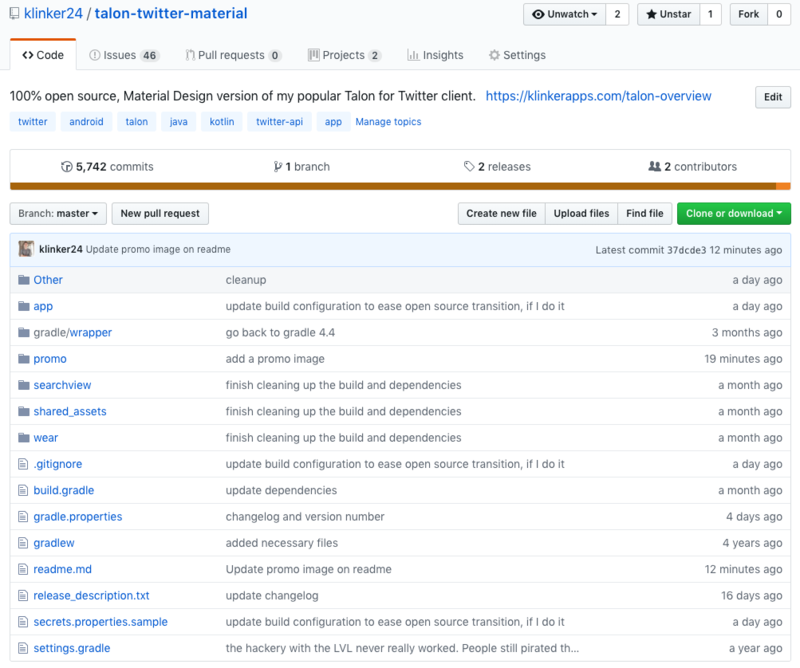 Most paid apps are obviously not open source, but this is the direction I wanted to take Talon. With the popularity, support, and success of this version of Talon, this is my most significant contribution to date. If you are a normal user, you really won't notice much difference. The app will continue to be distributed as a paid app, on Google Play. I will continue to update the app and contribute to it at the same frequency as I have for the past few years. All updates will come through Google Play, like normal. The benefit for you is that you could start to see contributions, ideas, features, and bug fixes from others who decide they want to work on the app. The benefits to you will be obvious! Talon is a very successful app. While I will be the first to admit that it is very far from perfect, it it could be a cool project to look at for inspiration, implementation details, and contributions. A lot of the base for the app was made when I was 18, in school, and teaching myself as I went. Most of that isn't good code, so don't judge it to harshly, but there are plenty of quality bits in there, as well! Go and take a look at the project! If you like what you see, feel free to give me a star to say "thanks". I have loved working on Talon over the years. It is an amazing project, with amazing fans. Hopefully this contribution is appreciated. There is a lot you can learn from a long-running project like this, and the learning will continue. Thanks for the support everyone, and sound off in the comments to let me know what you think!